A hernia is an area of weakness or complete disruption of the fibromuscular tissues of the body wall. 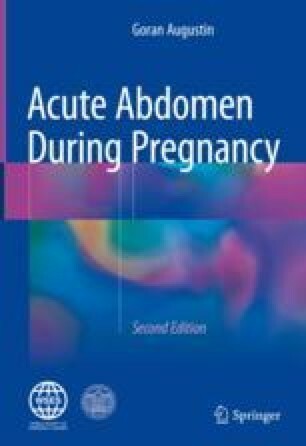 Abdominal wall hernias are not common during pregnancy because these are commonly repaired before a planned pregnancy to avoid possible complications during gestation. Hernias can be symptomless or have minimal symptoms, including slight discomfort or pain. Such hernias are not life-threatening and should be controlled on regular basis during pregnancy. Conservative measures should include weight control, the avoidance of heavy lifting, stool softeners, and abdominal binders. After spontaneous delivery and uterine involution, hernias should be repaired on an elective basis. It is of utmost importance for a clinician to diagnose emergent situations, which include incarceration, strangulation, and bowel perforation caused by a hernia because consultation with a surgeon and emergency operation are mandatory. There is still no consensus for an irreducible hernia during pregnancy, but complications during pregnancy outweigh semi-elective operation. (Incarcerated) gravid uterus in a hernia poses a specific problem because there is a higher risk of fetal death or obstetric complications. In this situation, operative treatment is almost a rule, which includes simultaneous obstetric and surgical management.